Last night at Hans Martin Schleyer Halle in Stuttgart, WBC Heavyweight Champion Vitali Klitschko retained his crown with a win over former WBC Cruiserweight titlist. 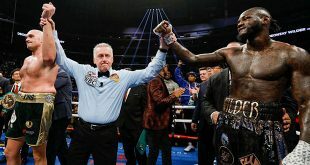 This was a messy bout, from start to finish, marred by many clinches, collisions, missed punches, and plain old awkwardness on the part of both fighters that just multiplied as they tried to put on a fight. Gomez tried to back Klitschko up in the first and got in a shot or two but the big Ukrainian was the one doing the advancing by round's end. Gomez switched tactics in the second and became a bit more selective with his offense but still had trouble getting in more than a few punches. Klitschko began to figure out Gomez and started hitting the target with long right hands and the lead left hook. Gomez became more aggressive at the start of the third until Klitschko put the Cuban on the defensive by coming forward. When Klitschko backed off, Gomez tried to push the pace again but the challenger was having trouble with the size and strength of Klitschko. The pair traded good shots at the beginning of the fourth but the heaviness of Klitschko's punches seemed to tell on Gomez. Klitschko slowed down to conserve energy and Gomez had a few good moments until the midway point when the champion began to up his workrate. Gomez at one point whipped in a few good right hooks during a clinch but that just served to wake Klitschko up as the Ukrainian began to follow up the jab with big right hands. The challenger tried pressure again at the start of the fifth, trying to unload the left, but Klitschko clinched effectively any time Gomez got close. Klitschko began timing Gomez on the way in and was punishing the Cuban for any ground gained. Gomez began trading with Klitschko and hit home with a few good left hands but was catching return fire for his efforts. Gomez's plan was paying off early in the sixth as he had his best round so far but Klitschko's booming responses held things in check. Klitschko upped his jab rate to start the seventh and began to pick off Gomez again. Gomez ate a few right hands before going all out to back up the champion, driving Klitschko back to the ropes during Gomez's most vigorous effort so far. Klitschko quickly reestablished his authority and began teeing off on the southpaw, shaking Gomez with big rights. After a clinch, Klitschko surprised Gomez with a lead right hand upper-hook that landed right on the jaw and the Cuban sagged to the canvas near the ropes. Gomez beat the count but was still shaky and getting nailed by the champion's follow-up assault. Gomez tried to back Klitschko off but his shots lacked authority and the big man was punishing in his attempts to finish off the stricken challenger. The two fighters fell to the floor in a clinch, buying Gomez some time but he was absorbing heavy leather from Klitschko once again as the round ended. Gomez got on his bike to start the eighth, looking for time to clear his head and shortly afterward was trying to fight back again. Klitschko was using the jab to gain openings for the right but Gomez managed to avoid most of the trouble through good footwork and reflexes. At the midway point, Gomez got in a good bodyshot but he was starting to look seriously winded. Klitschko seemed to hurt Gomez again in the last 15 seconds of the frame but couldn't put the former cruiserweight champ away. The ninth saw Klitschko cut right through his rival's defense with hard jabs right on the money until another big straight right rocked Gomez. The challenger was given some breathing room when Klitschko had a point taken away for gouging. Gomez's respite was short lived as Klitschko floored him almost immediately with combination on the ropes. Gomez beat the count and tried to trade with Klitschko in the centre of the ring with the inevitable right hands of the champion began again. 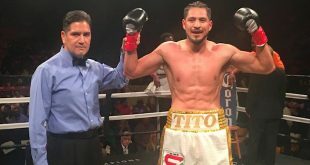 Gomez was hurt again and was finished off with a left hook, which forced a referee stoppage of the bout as Gomez could no longer defend himself. Vitali Klitschko moves to 37-2 (36) and retains the WBC title for the first time while Juan Carlos Gomez drops to 44-2 (35), losing for just the second time in a long career. 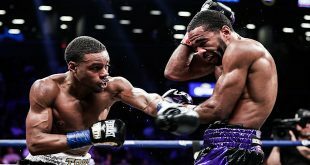 On the undercard, former IBF Heavyweight Champion Chris Byrd, 41-5-1 (22), stopped Matthius Sandow, 4-4 (4), in the fourth at cruiserweight and former heavyweight title challenger Tony Thompson, 32-2 (20), stopped Adna Serin, 19-10-1 (7), in the fifth.